The YRT pairing of Daniel Falzon and Cru Halliday topped FP1 at Wakefield Park in dry and warming conditions under a cloudy sky. A gnat’s whisker separated the pair at the top, a 58.075 to Falzon and 58.093 for Halliday. Next best in the opening session was Mike Jones on the DesmoSport Ducati, standing in for the injured Troy Bayliss. Maxwell and Herfoss were P4 and P5 respectively. 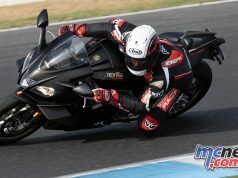 YRT had tested here privately in the lead up to this round, electing not to join the rest of the field during the official ASBK Test here earlier this month. At that test it was Wayne Maxwell atop the timesheets with a 57.659, heading Herfoss’ 57.728. But talk was that Mike Jones had actually gone a couple of tenths quicker again, but did not have a transponder fitted to net an official time. 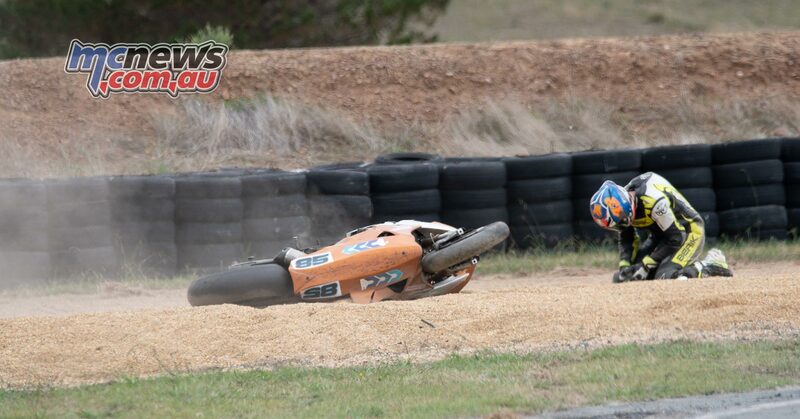 Aiden Wagner suffered a hefty tumble in FP1 here this morning, knocking himself and his machine around quite heavily. Wagner was P6 in the opening session ahead of Bryan Staring, Glenn Allerton and Josh Waters while Matt Walters rounded out the FP1 Top Ten. FP2 got underway at 1340 this afternoon and just as riders were really start to get down to business, a red flag put a temporary halt to proceedings. 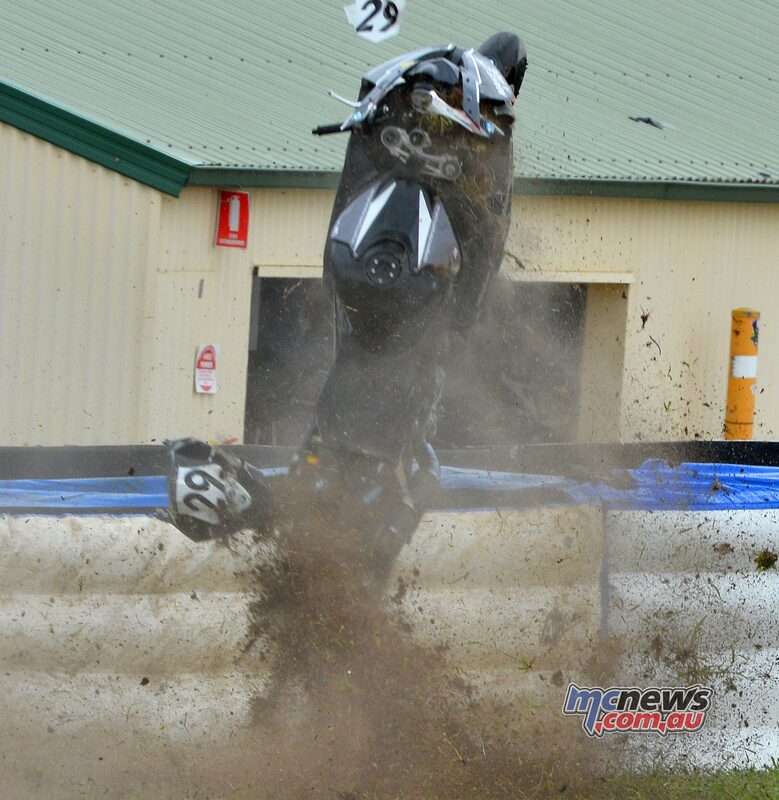 Sash Savin had gone down at turn two on his BMW and needed to be moved to safer ground. Cru Halliday was the first rider to dip into the 57s when the action got underway again just before 1400. A 57.916 to Halliday, who this year makes his return to Superbike after dominating the 600 Supersport category last year for YRT. Shortly after his team-mate joined him in that bracket, a 57.919 to Falzon, making it a YRT 1-2 at the top with 14-minutes remaining in the 30-minute Superbike FP2 session. Falzon then upped the game further, the young South Australian dropping in a 57.757 to top the charts. Herfoss then put in a 57.846 to go P2, splitting the YRT men. A couple of minutes later Herfoss then shot to the top with a 57.455. Maxwell then went P2 with a 57.754, pushing the YRT duo back to P3 and P4. The fastest recorded motorcycle lap time around Wakefield Park was a 57.182 set by Maxwell last year, will we see that beaten later this afternoon…? We thought that might be eclipsed later this afternoon in FP3 but then came the thunder and lightning! 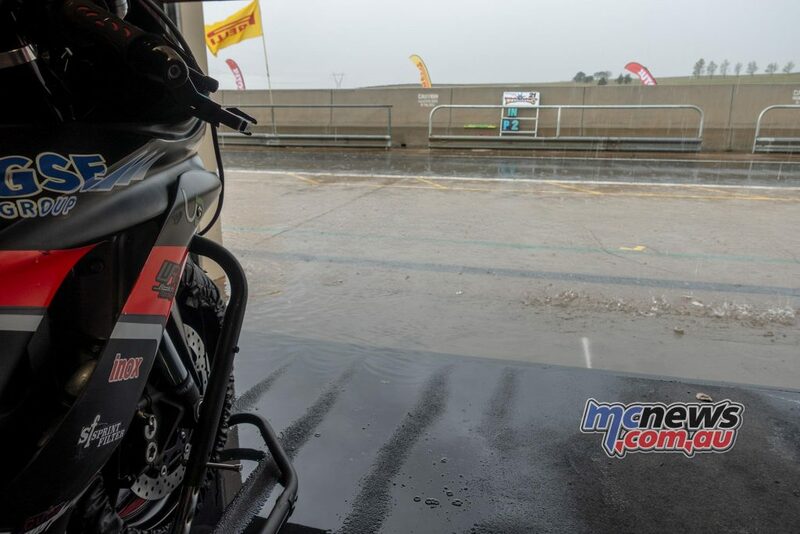 A massive downpour soaked the circuit shortly after 1500, and we would see no further quick times set today. 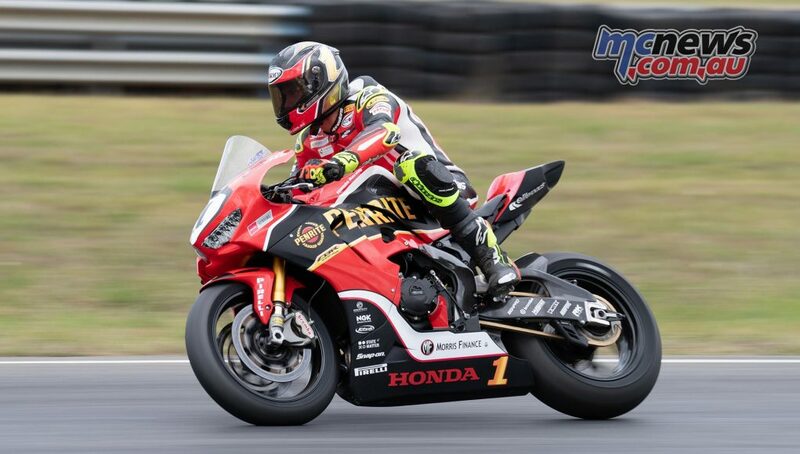 Local Goulburn lad Tom Toparis dominated the season opener at Phillip Island, and was obviously be out to do the same this weekend in front of his home crowd. There were a few young fellas out to try and stop that happening though. Oli Bayliss and Nic Liminton both on the early pace, a 61.238 to Toparis versus a 61.529 to Bayliss. Those times were expected to tumble in FP2 though, and that they did. Only a few minutes into FP2 though Nic Liminton stopped on track with a mechanical failure and the session was red flagged to check for any oil on the track. Oil was duly found and we had quite a delay while the track was cleaned. Liminton took no further part in FP2. When action recommenced it was Oli Bayliss setting the pace. At 15-years-old, Oli is making fast progress and the team have been working very hard in the lead-up to this first year in Supersport to give him the opportunity to shine, and it is a chance he is grabbing with both hands. His level of commitment, as can be seen in this great shot by Rob Mott, can certainly never be questioned. Times quickly started to drop further, Toparis the first man to dip under the magic minute mark, a 59.507 with ten minutes to go, a clear declaration of his intentions to dominate on home turf. And, it must be said, he does look in almost untouchable form. For the best of the rest to challenge him, they either need to make a significant step up, or Toparis needs to put a foot wrong. 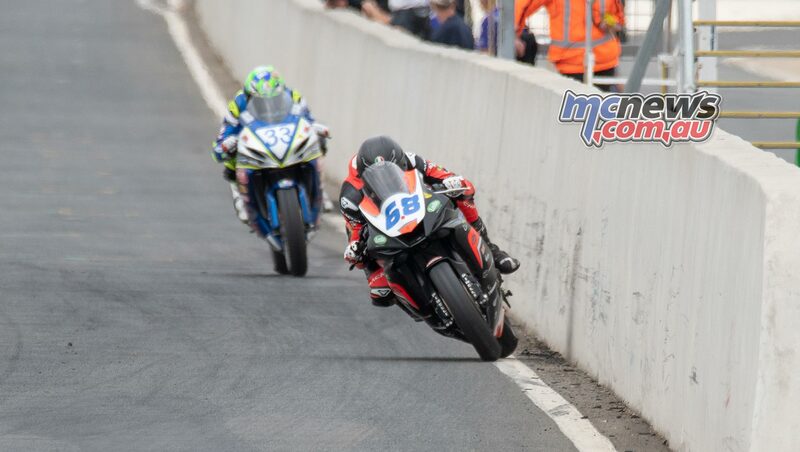 The Supersport lap record was set here last year by Cru Halliday at 59.050s, will Toparis best it this weekend…? In the Supersport 300 ranks it was Max Stauffer setting the pace from Harry Khouri, both riders under the existing lap record. Brandon Demmery returns to racing this weekend after that horrifying crash in the MotoGP support events at Phillip Island in 2017. Those injuries included a double compound fracture of the Tibia and Fibia, a compound fracture of the Femur, numerous break in his Pelvis, a broken right wrist, a torn bladder and an incredible amount of bruising. He was ninth in FP2 this morning at Wakefield Park and ended the day 11th on combined times. 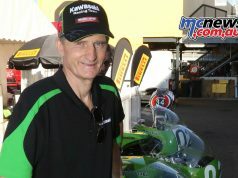 Three-wheelers join the ASBK action this weekend in Goulburn with the Horsell Consulting backed sidecar category making their first appearance for the year. The LCR outfit of Steven Bayliss and Aaron Wilson were the pacesetters today with a 67.243. The lap record for the category here at Wakefield Park is 65.309, and is expected to fall this weekend. 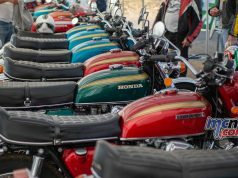 The 2019 bLU cRU Oceania Junior Cup roared into life for the first time ever at Wakefield Park today for the opening round of the new junior Road Race academy. The bLU cRU Oceania Junior Cup features a field of ambitious young riders looking to become the first to claim an Oceania Junior Cup round, and make an initial claim for one of the five positions in the 2019 Asia Talent Cup Selection Event, and a potential place in the 2019 Red Bull MotoGP Rookies Cup Selection Event.